Your little girl fills your life with joy, happiness, and all things bright and cheery. Shouldn’t her shoes do the same for her? Shoes are the ultimate girls accessory, and there is no reason your daughter needs to wait to grow up to own a truly spectacular pair. Lelli Kelly understands what little girls are made out of, and they put all of their wonderful attributes into their shoes. Twelve years ago, a husband and wife in Italy got together to create gorgeous, yet fun shoes for their little girl. They wanted something unique, girly, and very high-quality to meet all of their needs. Hence, Lelli Kelly was born. 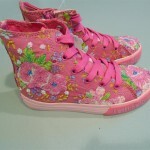 Lelli Kelly shoes are still designed & styled in Italy and are withheld to high European standards. Plus, every single shoe design is patented so that your little girl truly gets a unique look to complete her outfit. In order to withstand all of the playing, jumping and twirling that your little girl does, Lelli Kelly girls shoes are made with only the best materials. The insides are made of leather prevent your little girl’s feet from smelling after a busy day. They are padded with patented LATEX FOAM to prevent perspiration and to keep her feet dry. The outer soles are made of lightweight rubber so nothing will hold her back. Plus, they are skid resistant to ensure her safety as she goes about her day. 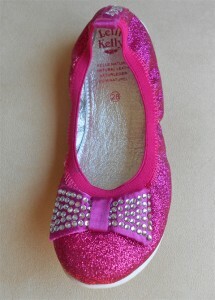 With Lelli Kelly shoes, your little girl can have shoes that show off her wonderful personality. The bright and cheery colors and delicate designs will make every outfit look divine. What girl doesn’t love to shop? These Lelli Kelly sandals focus on a girl’s favorite pastime with intricate beadings of shopping bags and purses. The pale blue background paired with the brightly-colored beads make for a stunning display that will make any little girl jump for joy. The leather materials will make these Lelli Kelly sandals last all summer long and the Velcro enclosures make them easy to slip on and off throughout the day. 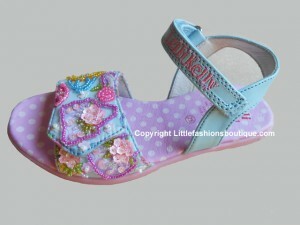 Your little girl will love being Mommy’s little helper in her shopper girl sandals. Your little girl will love getting dressed when she gets to complete her outfit with these fun Lelli Kelly flats.. The pink glitter will look great whether your girl is dressing up for a special occasion or simply wearing her favorite leggings to the park. She will feel all grown up with the sparkly bow adorning her toes. These flats are the epitome of all things girly, combining pink, glitter, and bows to make the perfect shoe for your girly girl. Bring out your daughter’s inner princess with these fun Lelli Kelly Mary Janes. She will feel like royalty as she wears these pink glitter shoes with exclusive tiara beading. The flower accents in blue and white help these shoes coordinate with a variety of outfits. You daughter will live like the princess she is as she romps about in these perfect princess shoes. If your little girl loves to run around and explore then these Lelli Kelly high-tops are the perfect shoes for her. The bright green background, hot pink sole and laces, and stunning beaded flowers make these shoes girly enough that she can show off her sweet personality while still allowing her to perform all of her fun daily activities with proper coverage. So let her run through the puddles and dance in the rain and let the shoes take care of the rest. All of these Lelli Kelly styes and lots more are now available for pre-order at littlefashionsboutique.com.